Indian Ladder Farms has everything you want in a Catskill Mountain vacation in one convenient (and stunningly beautiful) location. I'd recommend visiting just to sample their farm-to-glass hard cider, which tastes like a wish granted. It's crisp, dry, and a far cry from the overly sweet, commercially produced hard ciders of yore. But there's more! 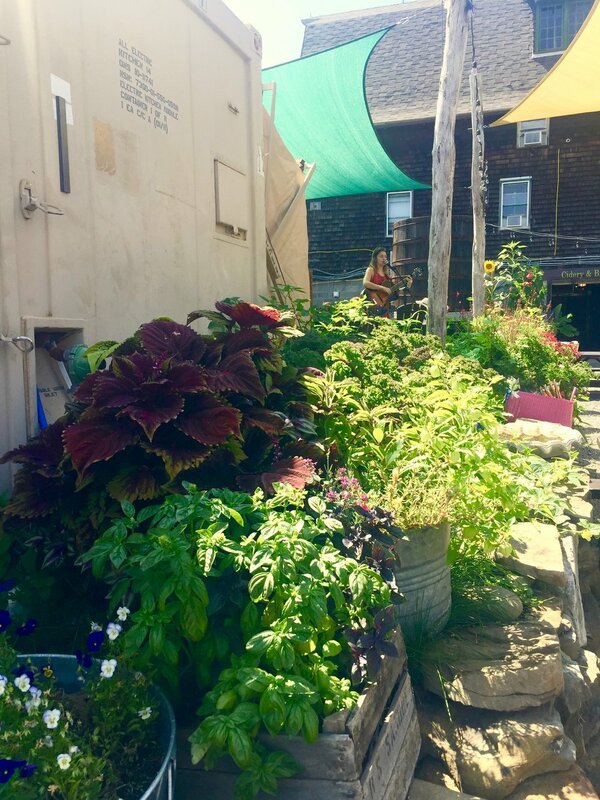 The beer and cider garden is insanely beautiful, and the food is ridiculously tasty (think crispy-creamy fried cheese curds with tart raspberry dipping sauce). Plus, they have idyllic fields of pick-your-own berries or apples or stone fruits, depending on the season. And they've got a playground, friendly farm animals, and a country store, and they host weddings. Outside, there's often live music on a stage surrounded by lush potted plants. In contrast, the indoor tasting room feels industrial but homey, with wood-paneled walls, hand-lettered signs, and a bar decorated with stickers. In a jewel-toned cider flight, tasting glasses show the hues of Indian Ladder apples meeting berries from the farm. 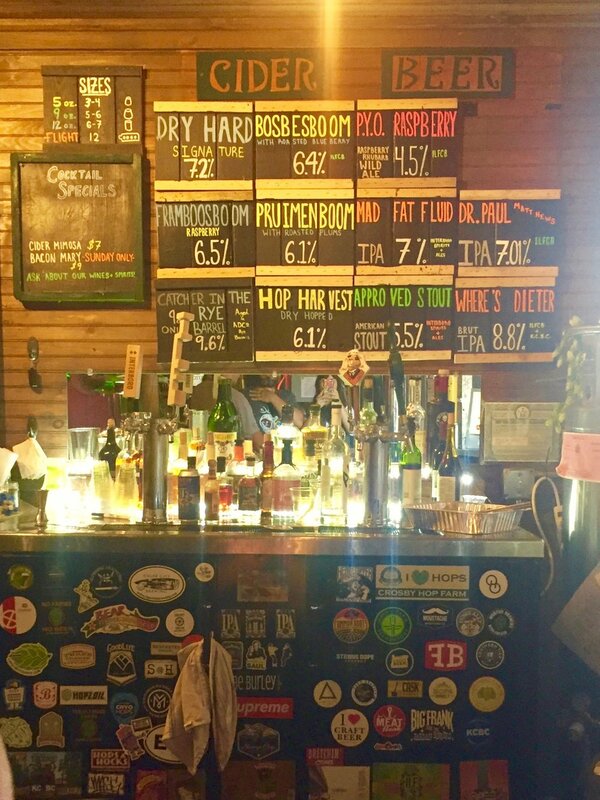 I loved the rich, mellow, fruity flavor of roasted blueberries in the Bosbesboom (the dutch word for "blueberry tree"), and I'm still thinking about the Catcher In the Rye Barrel Cider on draft, which was aged in rye whiskey barrels. It captured the smoky, boozy bite of bourbon in a light, musky cider. We brought home a case of the candy-colored cans, which really brightened up our fridge, but they belie the dryness of the cider. As sweet and flowery as the packaging may look, these cider are delicately flavored and never too sweet. But wait, there's so much more to Indian Ladder Farms! The berry fields that surround the cider and beer garden are beyond beautiful. I often tell people about the brilliance of having a playground behind Sloop Brewery, but if you're traveling with little kids, they've got nothing on Indian Ladder! The playground here has a big sandbox and a little petting zoo. There's a giant country store with old-timey candy, house-made berry-infused pancake syrup, and local honeys and jams. This place has so much more to offer than Windham's Catskill Mountain Country Store, which my kids also love. I think it's totally fair to say that Indian Ladder Farms is the ultimate one-stop shop for family-friendly food, drinks, music, and fun. We walked past this table of gorgeous, wildflower-accented arrangement in stylishly mismatched vases and talked about how magical it would be to host (or get invited to!) a wedding here. It's just the prettiest place, and we can't wait to go back. Indian Ladder Farms is located at 342 Altamont Road (Route 156), Altamont, NY. Check their website for updated hours, as their Farm Market, Yellow Rock Cafe, and Cidery & Brewery Tasting Room and Biergarten all have varying hours which may change seasonally. To find out what's in season, call their awesome Pick-Your-Own Hotline at (866) 640-PICK. Sep 26 Chef Rob Handel Returns to Heather Ridge Farm!